Do you suspect that you may have a broken tooth? Generally, most people notice when their tooth has been damaged. 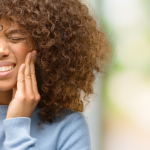 While a fully broken tooth is painful, even a cracked or chipped tooth can cause symptoms of pain, swelling, and sensitivity, without overtly visible signs. 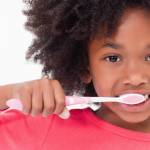 Leaving a broken tooth unattended can also result in more serious problems down the road. 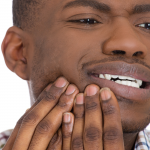 Rather than taking your broken tooth into your own hands, take it to Penn Dental Medicine. Don’t Pay the Price for an Untreated Broken Tooth! A broken, cracked, or damaged tooth is not something to ignore. Despite the fact that a dentist can offer several treatment methods to repair a compromised tooth, people can still tend to avoid the dentist. At Penn Dental Medicine, we strive to help put patients at ease. We’ll do everything we can to ensure your safety and comfort. While teeth, (particularly the enamel guarding the teeth) is the strongest material in your body, it’s not invincible. There are several fairly common foods and drinks that can lead to tooth damage. Of course, there are also lifestyle habits and behaviors that increase the likelihood of weakening tooth enamel. Don’t let concern about the affordability of your visit deter you from making an appointment to have your tooth repaired. The price you may pay for not fixing a tooth may include infection or more complicated dental procedures, such as a root canal treatment. Dental Bonding: Dental bonding or “composite bonding” is a method to repair broken, chipped, and cracked teeth. The dentist places a conditioning liquid on the damaged tooth. A putty will then be applied and molded to the compromised area. After this, ultraviolet light causes the composite to harden. After drying and hardening, the tooth bonding is polished to match the rest of the tooth. Crowns: People often confuse crowns with veneers. While veneers only cover the front of your tooth, a crown covers the entire injured area of the tooth and protects it. Getting a crown can prevent you from losing your tooth. If you don’t have a crown, you could further damage your tooth simply during the act of chewing. A crown is custom made for each dental patient. An impression is acquired of your tooth and is then sent to the lab. While you wait for the permanent crown, the dentist places a temporary crown on the tooth. When the permanent crown is ready, it can be attached to the remaining tooth structure. Dental Implant: When a crack extends below the gum line, the tooth is impossible to save with repair measures such as the ones listed above. You’ll need a tooth extraction accompanied by a dental implant. Dental implants serve as replacements for your natural teeth. A dental implant procedure is a longer process, compared with dental bonding and crowns because the dentist must prepare the area by making a new root with biocompatible titanium screws. These screws are fixed to the jawbone. Once the bone fuses with the screws, a strong foundation will be in place. Typically a few weeks after the bone has properly fused, the dentist will make an impression of your tooth and a crown will be placed. This new tooth will look and function just like a normal one. Where to Go for Affordable Broken Tooth Repair? 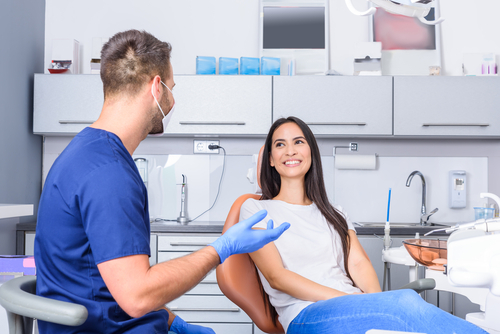 At Penn Dental Medicine, we make it our mission to provide affordable dental procedures to our patients by offering low-cost dental services out of our dental school clinic. We don’t want to see anyone suffer further health issues because they can’t pay for necessary treatment. We accept most dental insurance plans and if your plan doesn’t cover a specific procedure, we offer payment financing so you can pay a fixed monthly rate over a number of months. 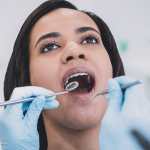 And, while your treatment time may be a bit longer, it’s important to understand that this is because Penn Dental Medicine student dentists follow best practices and resolve any urgent infections first. And all the while, each step is carefully monitored and reviewed by an educator. Please, don’t wait to fix a broken tooth. Schedule your appointment now at (215) 898-8965.